Simon Williams is a well known English chessplayer, commentator and coach. He also has a very good sense of humour, he has a very interesting technique which I presume he uses to coach children. He gives all the pawns a name! There are 8 pawns so they all get a name from A to H.
After last week`s elections it is possible to draw some conclusions. It is obvious the vast percentage of the Unionist electorate in North Belfast do not have the brains or backbone that is necessary sieze any type of political victory. 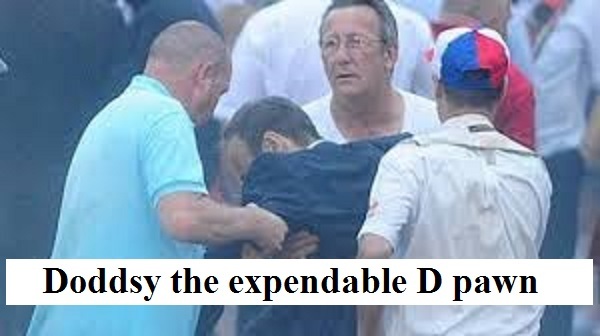 They had the perfect opportunity to turn Nigel Lundy into Doddsy the expendable D pawn and they blew it. I can only assume that there are vast numbers of Unionists in North Belfast who are happy being the pawns and stooges of Nigel, Nelson and the Kincora Old Boys and they must also enjoy being governed by the IRA. I hope they all enjoy the 12th day 2015 when the Ligoniel parade is once again stopped from proceeding up the Crumlin road and Nigel Lundy and co stand with two arms the one length urging people to make a “peaceful protest” then disperse or quite possibly some other plan which is 10 times worse! The situation in East Belfast is more promising. The electorate in East Belfast have now technically turned Gavin Lundy into Gavin the expendable G pawn. There are several thousand braindead Unionists who would vote for Gavin the G pawn no matter what treachery he performs simply because he is a member of the DUP aka Kincora Old Boys. The very same people would vote for the Pope of Rome if the Pope of Rome told them he was now a DUP member. However there are even more thousands of Unionist voters in East Belfast who are not so gullible and Gavin the expendable G pawn is at their mercy, they hold his future in their hands! It will be interesting to see if they are astute enough to exploit the expendable G pawn`s potential to it`s utmost before they need to sacrifice him. It would be very useful if Gavin the G pawn was forced to play an instrumental role in removing Peter Pinnochio Punt from office. After that he could also be used to play an instrumental role in removing the IRA from the government of N.Ireland. 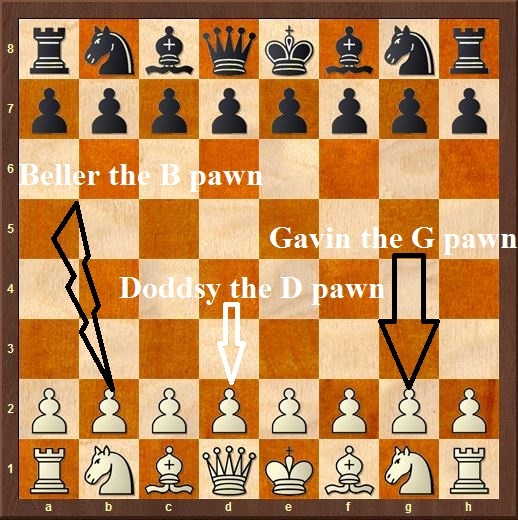 There is no end to the useful moves that an expendable G pawn can be forced to make. Plus there is a bonus! Gavin the expendable G pawn is not just any old expendable G pawn. 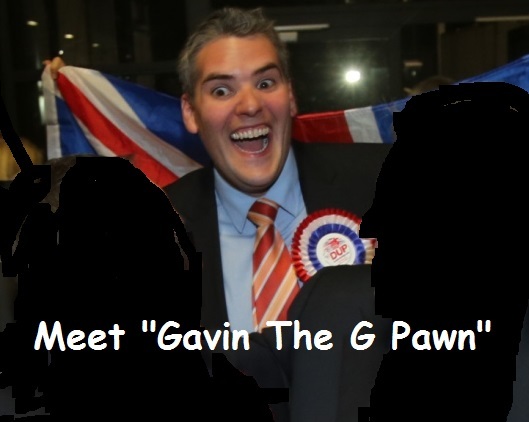 Gavin the G pawn happens to be a member of the Apostate Church of Ireland which means he is also an Apostate and he does not have a drop of true Protestant blood in his veins! That gives Gavin the expendable G pawn an extra expendabillity. He is already a traitor three times over any way, so he is no great loss to Unionism. The trick is just to use him in whatever way possible for the maximum benefit of the Unionist electorate in East Belfast. It should not really be too difficult should it? Beller the expendable B pawn can be exploited in lots of ways, expendable pawns can be made to do the most devastating damage in the right hands. 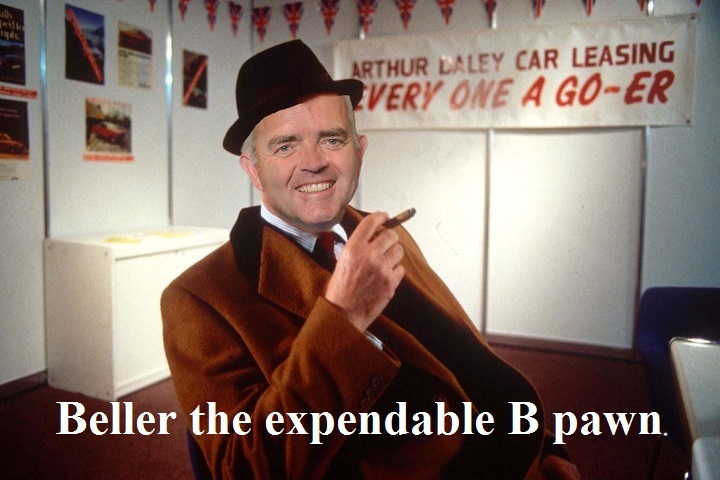 Hopefully the astute Unionists in South Belfast will now take control of Beller the expendable B pawn and use him to the ultimate of his maximum devastating potential. What is needed now is for a sizable section of the Unionist community to grasp the simple fact that all these so-called “political representatives” are not great, fearless, Unionist leaders with intellects four times bigger than the intellect of the average Unionist. All they are is expendable pawns and that is exactly how the Unionist community ought to treat them. They are as much use as blind, ignorant, dumb dogs which cannot bark! Isaiah 56: 10 His watchmen are blind: they are all ignorant, they are all dumb dogs, they cannot bark; sleeping, lying down, loving to slumber. 11 Yea, they are greedy dogs which can never have enough, and they are shepherds that cannot understand: they all look to their own way, every one for his gain, from his quarter. HOW DO YOU EXPLAIN TO OVERSEAS READERS WHAT A “COMMUNITY WORKER” IS?